The mega call centre is likely to be launched by November 2015. The Request for Proposal (RFP) tender for the call centre project is expected by the middle of June, which would be opened by July 15 and finalised by July 18, 2015. He has summoned the progress report on the Trans-Ganga project in Unnao from the concerned officials on May 30. Uttar Pradesh government has acquired over 2,000 hectares from farmers and land owners for the proposed 301 km Agra-Lucknow expressway. This together with around 121 hectares of government and Gram Sabha land makes up for 70 percent of total land required for one of the flagship projects of the Akhilesh Yadav government. The project estimated to cost about Rs 10,000 crore would traverse 10 districts viz. Agra, Firozabad, Mainpuri, Etawah, Auraiya, Kannauj, Kanpur City, Unnao, Hardoi and Lucknow. According to UP Expressways Industrial Development Authority (UPEIDA) sources, the government has so far acquired over 2,061 hectares of land from 22,525 farmers spanning 217 villages in these districts. Additional land across 15 other villages is still to be acquired and negotiations with farmers were underway. Interestingly, land acquisition has been lowest in pocket boroughs of SP chief Mulayam Singh Yadav in Firozabad, Mainpuri and Etawah, where acquisition percentage have stood at merely 40 percent, 17 percent and 34 percent respectively. Hardoi and Kannauj have clocked highest acquisition percentages at 100 and 95 percent respectively. Kannauj is the parliamentary constituency of Dimple Yadav, the wife of chief minister Akhilesh Yadav. Meanwhile, UPEIDA has sought Rs 1,350 crore from the finance department for part payment to farmers. Almost Rs 5,000 crore would be needed for land acquisition payments and the project is expected to be completed in 30-36 months. Initially, the expressway was planned on public private partnership (PPP) model. Since, it failed to garner investors due to economic slowdown. Subsequently, the government decided to adopt Engineering, Procurement and Construction (EPC) route, wherein the state would fund the project. The contract for the project, divided into five packages, has already been awarded to developers. PNC Infratech has been selected for package 1 (Agra-Firozabad); Afcons Infrastructure for package 2 (Firozabad-Etawah); Nagarjuna Construction Company for package 3 (Etawah-Kannauj); Afcons Infrastructure for package 4 (Kannauj-Unnao); and L&T for package 5 (Unnao-Lucknow). Following the high-level meeting on Wednesday, the government’s list of developers is all set to get the state cabinet’s nod next week. With its stakes high in 2017 Assembly election in the state, the Samajwadi Party government has become desperate to complete its ambitious 302 km-long Lucknow-Agra Expressway project before the election arrives. The government’s eagerness is clear from its decision to bring forward the project-completion deadline by six months — from 36 months to 30 months stating from the time it hands over the letter of intent to the developers this year – and introduce an incentive-based scheme whereby developers will be monetarily rewarded if they finish the project before the new deadline. The CEO of Uttar Pradesh Expressway Industrial Development Authority (UPEIDA), Navneet Sehgal said the monetary incentives could go up to Rs 6 crore, with each developer’s incentive to be calculated in terms of percentage (averaging 0.4) of the total cost of the package undertaken by it. For the construction work of the expressway, which will be developed in five stretches, the state government has chosen its list of developers for each stretch. “The deadline for the construction of each of these five stretch is 30 months and we would give incentives up to 0.4 per cent of the cost of the concerned package to the developers for early completion,” Sehgal told The Indian Express. He added that different stages have been set for early completion and percentage of the incentive would be given depending on how early the concerned project is completed. Following the high-level meeting on Wednesday, the government’s list of developers is all set to get the state cabinet’s nod next week. The state government has set the deadline to hand over the letter of intent to these developers by the end of this month and start the construction work from October onwards. Simultaneously, the state wgovernment is also taking up the land acquisition process at a fast pace. Sources inform that about 50 per cent of the land required for the project (about 1,500 hectare) has already been acquired. Out of the 232 villages that would come under the project areas, agreement has been signed with farmers in almost 207 villages, leaving only 25 villages where the government is negotiating compensation rates as farmers are not yet satisfied with the rates offered. Moreover, in another initiative to take forward the project, the state has decided to hire the services of a “professional engineering company” that would monitor the project on behalf of the UPEIDA. LUCKNOW: The bidding process for Chief Minister Akhilesh Yadav’s dream project, the 301 km long six lane Lucknow to Agra Expressway was completed on Wednesday. Senior officials shortlisted the lowest bidders and the final contract would be signed shortly. UP Expressway Industrial Authority ( UPEDIA) Chairman and CEO, Navneet Sehgal said that financial bids had been submitted by various developers which were opened on Wednesday and the bid evaluation committee identified the lowest bidders. PNC Infratech was found to be the lowest bidder for the Agra-Firozabad stretch, Afcons Infrastructure for Firozabad-Etawah stretch, Nagarjuna Construction Company for Etawah-Kannauj, Afcons Infrastrcuture for Kannauj-Unnao, and L&T for Unnao-Lucknow. The Lucknow to Agra Expressway has been divided to five stretches or packages for handing out the construction contract of the access controlled way expressway would be of 6 lanes extendable to 8. The expressway will be built under the EPC (Engineering, Procurement and Construction) model, and will be funded by the state government. The government is also purchasing land directly from the farmers for this project. Officials said that land has been acquired in most places and the construction is expected to be complete in 3 years. Investment to the tune of nearly 10,000 crores is expected in the expressway which will also have several manufacturing zones and industrial clusters coming up alongside it. The expressway is expected to cut down the travel time between Lucknow to Agra to under 4 hours from the present 8 hours. Modern agriculture Mandis and green belt is also planned along the expressway which will pass through Mainpuri, Etawah, Kannauj, Firozabad, Fatehabad, Unnao joining Lucknow to Agra. Along with the existing Yamuna Expressway which links Agar to Noida (Delhi) the tow expressways will connect the state capital with the national capital spurring economic growth through the entire region. LUCKNOW: To expedite execution of the Agra-Lucknow Greenfield expressway project, Uttar Pradesh government on Thursday directed 10 district magistrates to fix dates of public hearing for environmental clearance. In a review meeting, chief secretary Alok Ranjan said Rs 500 crore had been released to the concerned districts for purchasing land where farmers and government have reached mutual agreement. Ranjan also directed DMs to send estimates to Uttar Pradesh Expressways Industrial Development Authority (UPEIDA) of the additional amount that may be required for buying land. He said assets located on the land of farmers should be evaluated for reasonable compensation. The Agra-Lucknow expressway will facilitate faster transport between western UP and Lucknow that will also bring socio-economic development to the areas covered under the expressway project. The chief secretary said an express business facility will be developed between Lucknow and Agra, Firozabad, Etawah, Kannauj, Auraiya, Kanpur, among others, to boost industrial corridors connecting manufacturing units. The Uttar Pradesh Government is planning a six lane expressway linking Agra with Lucknow in the state. The Uttar Pradesh Expressways Industrial Development Authority is implementing the 270-km project which is estimated to cost Rs 9,155 crore, excluding land cost. The access-control Agra- Lucknow Expressway Project will have service road on either side, and will be eventually extended to Delhi with the Yamuna Expressway. The greenfield project will be executed by a PPP through an SPV on DBFOT model. The proposed six lane highway can be expanded to eight lanes. The project will provide linkage between Western Uttar Pradesh and Lucknow, besides linking Agra, Firozabad, Shikhoabad, Etawah, Kannauj and other central parts of the State. Currently, RFQs have been invited from prospective bidders for the project. It will have provisions such as road over bridge, road under bridge, interchange or flyovers to ensure uninterrupted traffic flow. The project is expected to be commissioned by 2017. LUCKNOW: Two bidders have applied for selection as project development consultant for Agra-Lucknow expressway. The bidders are Consortium of M/s Feedback Infrastructure Services Pvt. Ltd. with M/s Redecon (India) Pvt Ltd and consortium of M/s Egis India Consulting Engineers Pvt Ltd with Ernst & Young Pvt Ltd. The eight-lane eco-friendly greenfield expressway is proposed to be built on minimum distance formula through public-private partnership model. Both bidders made detailed technical presentation to Consultant Evaluation Committee under the chairmanship of infrastructure and industrial development commissioner (IIDC) Anil Kumar Gupta here on Monday. The presentations focused on experience of bidders in imparting consultancy services for development of expressways and road projects along with proposed methodology for time-bound completion of work. A concept report has already been prepared and accepted for this project. Implementing and nodal agency for first of its kind PPP expressway project is Uttar Pradesh Expressways Industrial Authority (UPEIDA). CEO, UPEIDA, Mukul Singhal said the evaluation of technical bids would be completed within a week and then financial bids would be opened for selection of the consultant. Envisaged to provide a smooth link between Lucknow and Agra, this expressway will be built covering a distance of about 270 km. Scope of work for project development consultant would include preparation of feasibility studies and feasibility report of the expressway project for the purpose of firming up the requirements in respect of development and construction of the expressway and project facilities. To maintain ecological balance, a large number of trees would be planted for retaining the rain water in the field. Suitable techniques of rain harvesting would be adopted to raising groundwater level. Eco-friendly parks would be developed along the expressway for neutralising air and noise pollution and maintaining ecological balance owing to this expressway. Further, to maintain greenery and abundant water supply lakes and ponds would be developed on both sides of the proposed Agra-Lucknow expressway. This “08 lane access controlled Expressway” from Agra to Lucknow has been considered for constructing under PPP mode. This green field expressway shall be based on minimum distance formula having the potential of providing a smooth link from Greater Noida to Lucknow. Hence the journey time from Greater Noida to Lucknow via Agra covering about 530 km, presently consumes time of around 9 hours would now drastically be reduced to 5 hours. Likewise the 6 hours journey of 365 km between Agra and Lucknow would reduce to around 3.30 hours through this proposed Expressway. UPEIDA has been nominated as nodal agency. In order to maintain Ecological balance a large numbers of trees would be planted for retaining the rain water in the field. Suitable techniques of rain harvesting shall also be adopted to raising ground water level. Eco-friendly parks shall be developed along the expressway for neutralizing air and noise pollution and maintaining ecological balance owing to this expressway. Further, to maintain greenery and abundant water supply Lakes and Ponds shall be developed on both sides of proposed Agra-Lucknow expressway. The proposed Agra-Lucknow Expressway, to be built at an estimated cost of Rs 10,435 crore under the public-private partnership (PPP) model, would connect four industrial hubs along the route. Four growth centres have been identified along the proposed expressway, namely Glass City in Ferozabad; Pragati Nagar near Karhal and Saifai;, Khushboo City near Kannauj; and Malihabad, which will be involved in the food processing and packaging and the marketing industries. “The growth centres would be commercial, business and civic hubs which would help realise the potential of local traits and materials to boost the local economy,” state Infrastructure & Industrial Development Commissioner (IIDC) Anil K Gupta said here. The locations of the growth centres are tentative and changes could be made on the basis of a detailed project report (DPR). Four link roads, including the 9 km Agra link road, 15 km Ferozabad link road, 26 km Kannauj link road and 14 km Lucknow link road have been proposed to provide access to the growth centres. The PPP Monitoring Committee (PPPMC), headed by Gupta, has approved the concept report in this regard. The process to select a project development consultant to prepare the DPR would start soon commenced soon. “Alternative bidding for the selection of developers to implement either the entire expressway as a single project or in packages has been included in the concept report to expedite execution,” Gupta said. 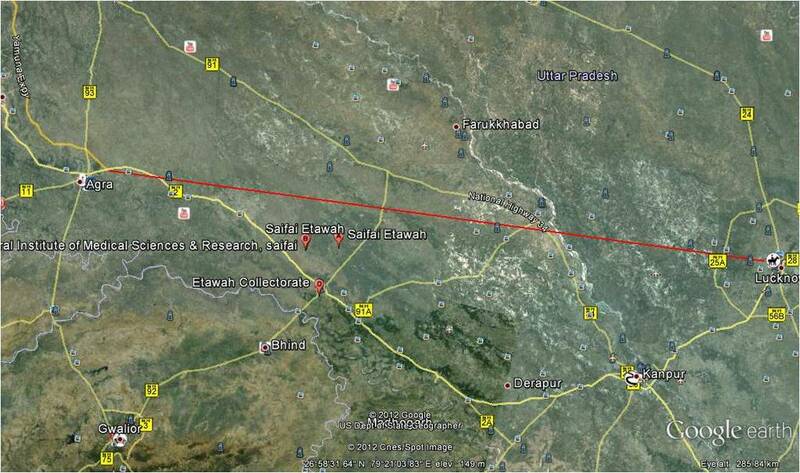 To be built on minimum distance separation formula, the finalised alignment proposes a 270 km long, six-lane expressway, which might be expanded to eight lanes, starting from the Agra ring road close to the Yamuna Expressway and passing through Fatehabad, Shikohabad, Saifai, NH-92 near Etawah, NH-91 near Kannauj and NH-25A near Malihabad, and culminating at the inner ring road in Lucknow. Apart from cutting travel time between Lucknow and Agra to three hours from the current seven hours, the controlled-access expressway would enable swift transportation of perishable farm produce bigger markets and boost tourism, as it would connect to the already functional Yamuna Expressway between Greater Noida and Agra. LUCKNOW: The Uttar Pradesh cabinet on Tuesday approved the construction of the Agra-Lucknow expressway on the public-private partnership model. In a meeting chaired by chief minister Akhilesh Yadav, the cabinet also cleared the proposal to build the green-field, eco-friendly expressway project, based on minimum distance formula, along the 270km Agra-Lucknow expressway, connecting Agra’s Ring Road near Yamuna expressway with Lucknow’s inner ring road. In the process, the expressway project, as per the draft concept report which was also sanctioned on Tuesday, will pass through Fatehabad, Shikohabad, Saifai, NH-92 near Etawah, NH-91 near Kannauj and NH-25A near Malihabad. In another significant development, the cabinet also approved the setting up of a joint venture company in the ratio of 51:49 between Tamil Nadu-based Neyveli Lignite Corporation Ltd (NLC), a company under Union coal ministry, and Uttar Pradesh Rajya Vidyut Utpadan Nigam Limited (UPRVUNL), for 1,980 MW thermal power project at Ghatampur in Kanpur. Meant to operationalise three 660-MW thermal power plants, the foundation stone of this project was among the nine power projects sanctioned by the Mayawati government. Though the project was inaugurated by the Union coal minister Sriprakash Jaiswal and chief minister Akhilesh Yadav in June this year, in its first phase, the Ghatampur plant will become operational by 2015. By 2022, the capacity of Ghatampur plant, senior officials said, would be increased to 4,000 MW. Among other decisions, the cabinet approved the construction of a sports college for men in Saifai, apart from a proposal to use biometric smart cards to BPL and APL card holders for purchasing produce from fair price shops. The cabinet also said smart card readers will be made available at shops in order to prevent misuse. In another decision, the state cabinet decided to directly credit into their bank accounts, the scholarship amount being given to scheduled caste and scheduled tribe students who have passe class X. In a decision that might assist better planning for the newly carved out districts — Sambhal, Shamli and Hapur — the cabinet decided to restructure the District Planning Committee. Under the new plan, while the Sambhal committee will have 30 members, Shamli and Hapur will have 15 members each. In a similar vein, the cabinet also approved the strength of 40 members for Moradabad and Muzaffarnagar, 35 for Badaun and 15 for Ghaziabad districts. The cabinet also okayed Rs 4,100 government guarantee to UP rural development bank for taking loans from NABARD and opening of nursing schools for training of ANMs.